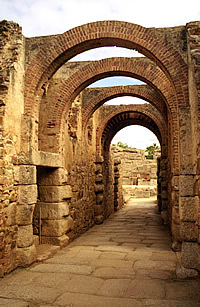 This area of Spain has an amazingly wide variety of things to see from paleolithic rock engravings and stunning Roman remains to medieval villages and evocative battlefields. We loved staying in the historic Paradors and exploring such a fascinating region. 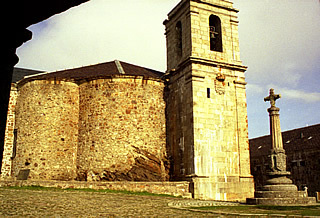 We first visited Avila in 1997 driving from Toledo and passing some interesting looking castles but we didn't stop until we arrived in this ancient town hoping for lunch. Unfortunately we were way too early and had to settle for a beer in the square and a baguette to keep us going on the road! Too hot for travelling without air conditioning! 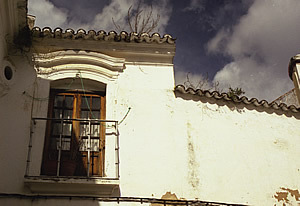 In 2002 we were flying into Madrid so decided to spend a night here and explore a little more. At 1131m above sea level this is a cool spot in summer and can be very cold at any other time of year! It is situated on a very exposed plateau so the winds can be biting! We had been very impressed by the medieval walls and this time we were able to walk around the town on them (charged a small fee of 2 Euros each). These are some of the most impressive walls we've seen anywhere and the town is well worth a detour for this reason alone if you are in the area. We also had a very good evening meal here - the lamb excellent as usual and the Yllera well up to standard. 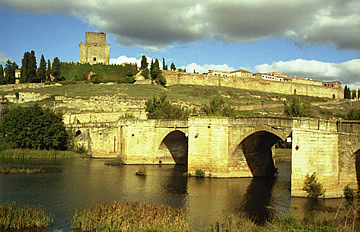 The Roman Bridge with the Alcazar (now the Parador) behind. The following day we drove to Ciudad Rodrigo. As one of the driving forces for this trip was to visit significant sites of the Peninsular War, Ciudad Rodrigo was one place we had visit. 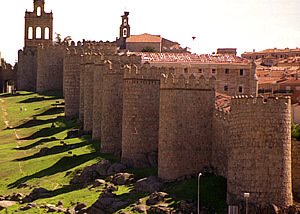 We stayed in the lovely Parador, Andrew delighted that we had been given the corner room, with balcony, overlooking the site of the gun captured by O'Toole! 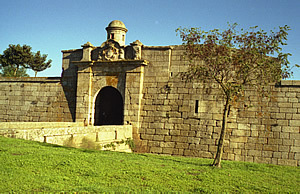 Those who would like to learn more about the significance of Ciudad Rodrigo in the Peninsular War should visit Andrew's Website. 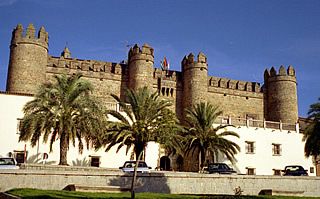 The Parador is, in fact, the 14th century Alcazar of the town. 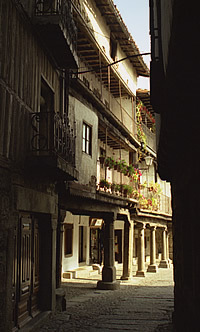 Many paradors are housed in ancient buildings and are wonderfully atmospheric places to stay. 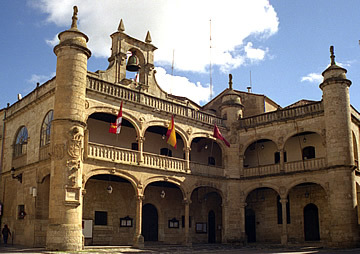 Ciudad Rodrigo is a delightful town, with beautiful buildings, spacious piazzas and pleasant people. 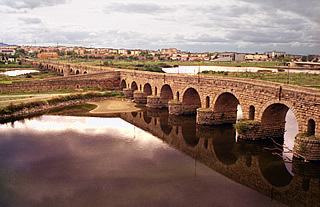 It is situated high on a hill overlooking the Rio Agueda and its Roman Bridge. There has been a settlement here for thousands of years. 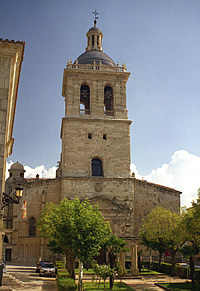 Though the cathedral was begun in the twelfth century it took several centuries before it was completed and thus displays a range of architectural styles. 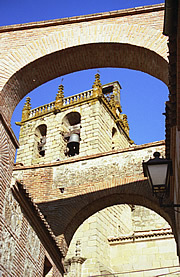 The bell tower is pockmarked as a result of the many battles the town has seen. 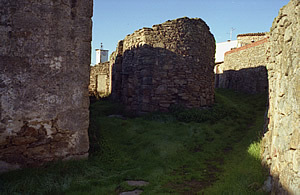 Defensive walls and ditch with the cathedral tower behind. 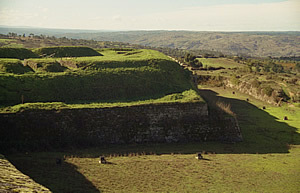 Part of the defensive wall with the Bull Ring in the background. 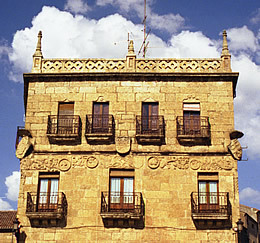 In the Plaza Mayor stand two of the most attractive buildings - the Ayuntamiento (Town Hall) and the Casa de los Cueto. 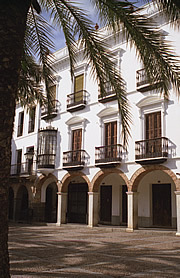 The Ayuntamiento is a very elegant building with beautiful arcading to the ground and first floor. 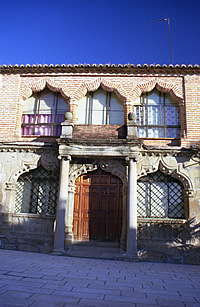 The Casa de los Cuento has more decorative features, in particular a frieze between the two upper floors. 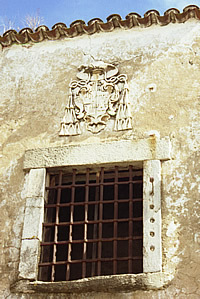 As in many other buildings in the town, coats of arms in stone are prominent on the walls of Casa de los Cuento, in particular at the corners. 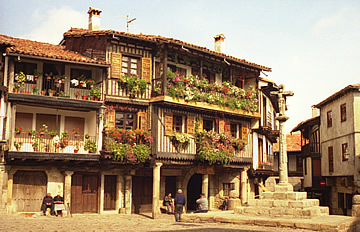 Plaza Mayor: The Ayuntamiento or Town Hall. 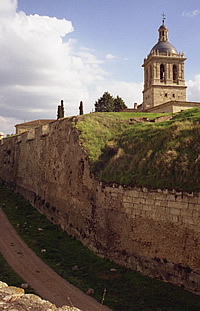 Ciudad Rodrigo was twice besieged during the Peninsular War of 1808-1814. Taken by the French from the Spanish after a siege lasting 25 days in the summer of 1810, it was retaken by Wellington on 19th January 1812. 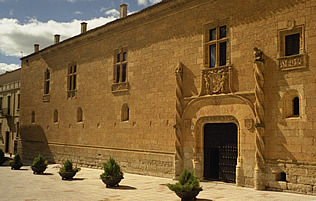 After capturing the town, Wellington stayed at a very fine house in Ciudad Rodrigo, the Palacio de Los Castro, the entrance to which is flanked by beautiful barleysugar twist columns. 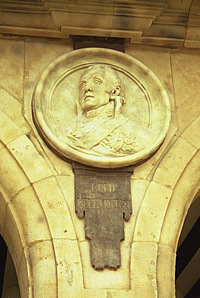 The entrance to Wellington's house. While staying in Ciudad Rodrigo we generally ate breakfast in one of the cafés in the town, having churros for preference, but had two or three evening meals in the parador which were very good! Suckling pig is always a good bet in Spain but we also particularly enjoyed a potato, cod and pepper dish as a starter, and rabbit and lamb - the Spanish certainly know how to eat well! We also ate snacks in the cafés at various times - on one memorable occasion a video of what seemed to be amateur matadors was being shown, enthusiastically watched by the locals, and one old man claimed to be one of those gored - it certainly looked like him! 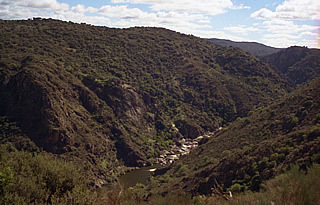 South east of Ciudad Rodrigo the route traverses mountain scenery with odd greenish rock slides - presumably lichen-covered boulders. Strange “drippy” trees are probably festooned with Spanish moss! 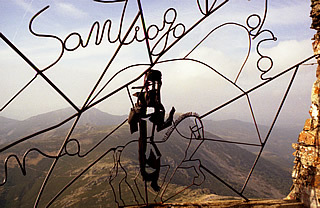 Some 25 kms away is Pena de Francia, a 1700m peak. 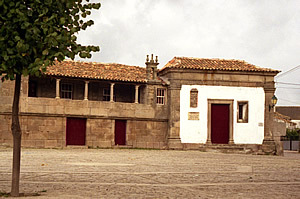 At its summit is a complex of buildings built by Dominican monks in the fifteenth century to guard an image of the Virgin Mary and provide shelter for pilgrims. At the monastery we visited the church which has a very curious feature: climbing narrow steps behind the altar you find yourself behind the statue of the Black Madonna. The tiling in the apse is lovely - sparkling and vaguely Russian in style. There are some very fine views from the peak but it was a little hazy for great photographs. 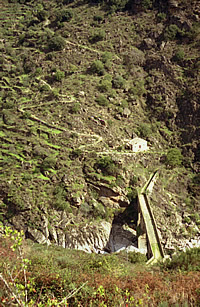 15km east of Pena de Francia we came to La Alberca - our main reason for venturing in this direction. It is an amazing medieval town which seems to be undergoing renovation. 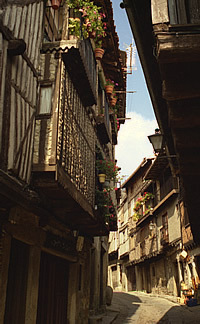 The houses are timber-framed, filled in with stones, plaster and all kinds of material - most of the buildings now look pristine. In the Plaza Publica, harvested walnuts are laid out on the ground drying. Old men and women sit around the square. Some look really ancient but the skin of the old women looks remarkably smooth - perhaps walnut oil? We had an excellent lunch in a café here - potato (mash and boiled - orange as usual here!) with lamb, which is excellent, then chicken with pepper and chips. The meal came with bread and wine - in practice the bottle of house wine was left on the table and you can take as much as you wish. No-one abuses this system. After lunch we drove to the Sierra de Gata - we noticed huge tracts of land had been burned. This is a forested, mountainous region and we made a detour to visit La Huerte, an extremely isolated village which looks very primitive. The landscape here is covered with olive trees and the harvest is in full swing. Again, many of the inhabitants look very old: old ladies all in black, old men leading horses and donkeys loaded with crates of olives, one woman washing cabbage at the communal fountain. Obviously no running water in the very mean, small buildings where the people live. This was by no means the only place, however, where we saw women washing cabbage at the fountain. We didn’t linger long! All through the mountains we’d seen old men and women walking - often far from any town and with no obvious close destination. These must be very tough people. 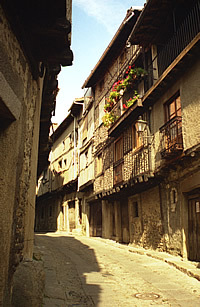 Narrow lanes in the village of Fuentes de Oñoro. One of the fine entrances to Almeida. Tracing battles and marches means you get to see bits of a country not normally visited by tourists. 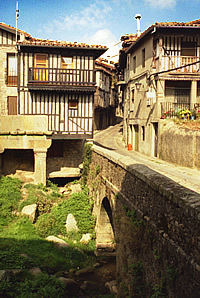 Fuentes de Oñoro, Poco Velho, Freineda all stir the heart of a military historian - for me it was a chance to see small rural towns and villages and, admittedly, Wellington’s quarters in Freineda which are naturally the most impressive building in the village! The Bridge over the River Coa, heroically defended by the 95th Rifles against the French, 24th July 1810. 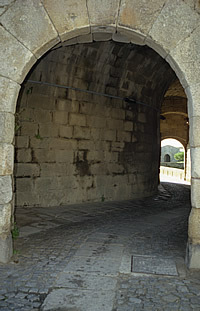 Almeida: staggered entrance to the town. Another fine gateway to Almeida. 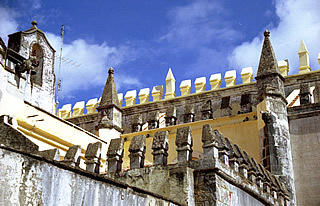 The main destination this day was Almeida in Portugal - a very impressive fortified town with fine entrance gates. 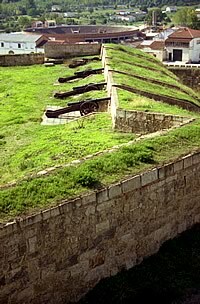 The fantastic star-shaped battlements need aerial photography to do them justice! We had a terrific lunch in the Pousada - roast kid with an excellent bottle of Bairrada. 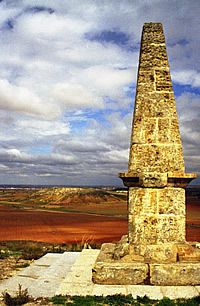 Monument to the Battle of Salamanca at Los Arapiles. We revisited Salamanca (previous visit Central Spain Autumn 1997) which is a beautiful city, though we’re unimpressed by the painted concrete bulls everywhere! 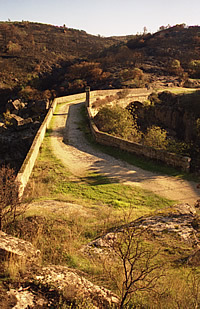 Our main reason for returning was Los Arapiles: scene of Wellington’s famous victory over the French on 22nd July 1812. 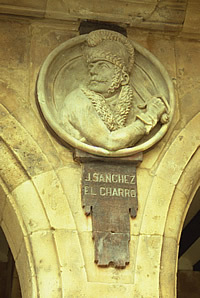 J Sanchez, El Charro - guerilla leader. 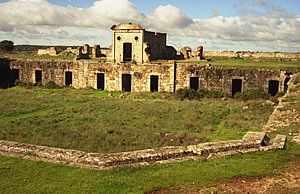 We also made trips to Barba del Puerco, where the bridge, set in a spectacular gorge, saw the 95th Rifles fight off a French attack on the night of 19th/20th March 1810, and to the impressive ruins, east of Almeida, of Fort Concepcion, blown up by the British on 21st July 1810. Unaware of the existence of this before arriving in the area, it was my highlight of the holiday. 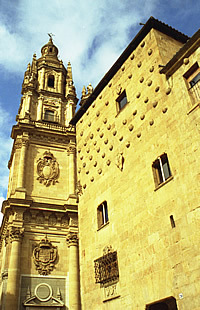 The site is located at Siega Verde in the region of Salamanca and many images have been discovered. 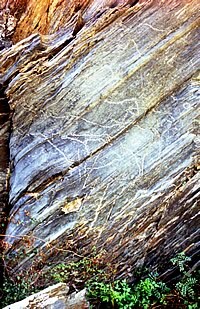 The art is carved onto rocks: horses, bulls and one of an antelope looking back over its shoulder, though this wasn’t the clearest. I've manipulated contrast of the images here to make the carvings stand out. These carvings are 20000 years old and marvellous to see, to think you are standing looking a carving created so long ago. 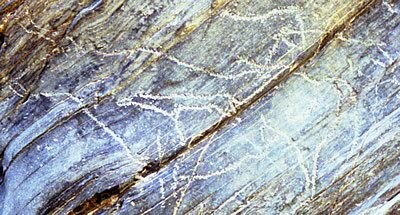 Someone stood or sat here and, probably with intense concentration, deliberately carved these images into the rock. It’s a beautiful, peaceful location, down by the riverside littered with boulders, with maybe lots more carvings to find. 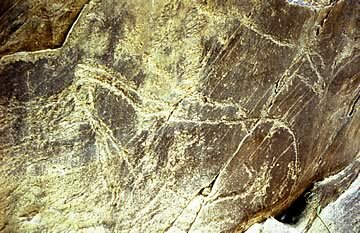 I understand that, though there are quite a lot of examples of paleolithic art in caves in southern France and the Iberian peninsula, there are very few sites in the open air, so we felt very privileged to be able to view these engravings. We were shown around by a Spanish speaking guide, with a French description of the interior displays. We were headed for Caceres and first went via El Bodon, a little village with a huge church, to try to find the site of the 1811 battlefield but it was not obvious where it might have been so took lots of covering photographs! Then on to the magnificent Roman Bridge at Alcantera. 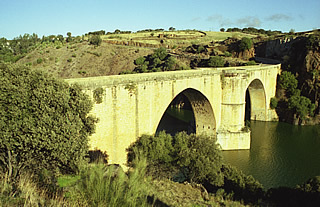 Emperor Trajan had this wonderful bridge built across the Tagus in 106 A.D. and it is made of massive blocks of granite. The amazing thing is that there is no mortar used in its construction! 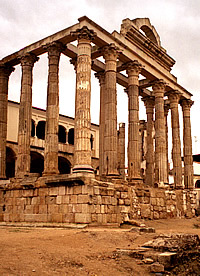 The arch in the middle and the small chapel at one end are also Roman. This walled Moorish hilltop town has several splendid palazzos and we had lunch here and spent a pleasant couple of hours wandering around its golden-stoned streets before going to our next lodging in Trujillo. Our visit to Trujillo began terribly. We had booked to stay at the Finca Santa Marta, hoping for a pleasant rural retreat, a different experience to the paradors. Well, in that respect we weren’t disappointed - it was certainly different. This is the single worst experience we have had in places to stay. To say it was a disappointment is a vast understatement. We were first shown to the most dismal, grim, dingy room with twin beds (called Grulla). It was so horrible we asked to be given a different room, which the young lad in charge did. The new room, Sierra, contained a double bed, rickety, ancient sticks of furniture and a tiny bathroom with an open grille into the bedroom. Not pleasant but an improvement on Grulla! Nevertheless, I didn’t feel comfortable and wouldn’t unpack. We were just about to leave to get dinner in Trujillo when the proprietor caught us and insisted we stay in Grulla as he had guests who wanted to put an extra bed in their room and Sierra was the only one big enough. We refused, insisting that he honour our reservation for a room with a double bed - no way was I staying in Grulla! We decided we were only going to stay one night rather than the original two, and he had a room for a single night. This room was unpleasant in new and different ways! The floor covering - one hesitates to call it a carpet - was a thin, green cloth, stained with brown patches and hiding, we think, a manhole cover - we didn’t dare look! The tiny, cramped bathroom had louvered doors through which all was visible. 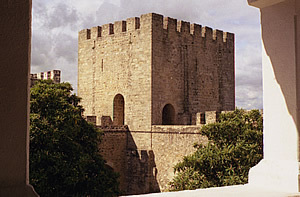 We beat a hasty retreat to Trujillo and managed to get the last available room - a suite - in the Parador for the following night. This was to cost us 110 Euros - the Finca had offered us a so-called suite for 120 Euros which we refused! After an excellent light meal of melon and Serrano ham in a restaurant in the Plaza Major we returned to the Finca. The night was awful. We could hear some kind of insects (death watch beetle?) making their way around the walls which meant I got very little sleep! I got up and out as fast as I could in the morning, refusing to use the nasty little bathroom. With only a cook around so early we paid for the one night and got out as fast as possible. Vowed to avoid all agricultural experiences in future. Since that day “not as bad as the Finca” has become a new standard of awfulness! 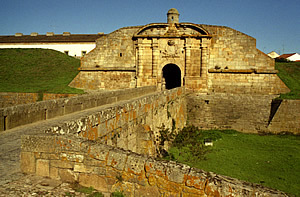 It was way too early to take our room at the parador so we went off in search of Peninsular War-related sites, through the Pass of Mirabete to find Fort Napoleon and the bonus of an excellent Roman Bridge at Almaraz. 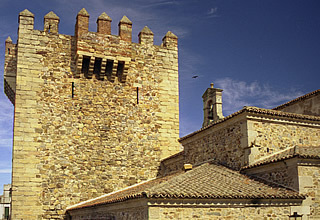 Then to the parador and our lovely room – bliss. I spent half an hour in the bathroom taking a reviving shower. 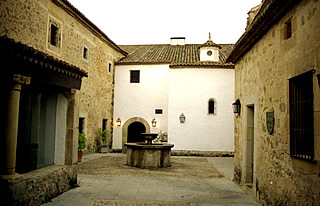 The parador was originally a 16th century convent and is situated in the old town. It has beautiful cloisters and a huge vaulted ante-room (pity about the TV!) to the much smaller dining room which was originally the convent's chapel – rather a strange experience eating in a chapel! 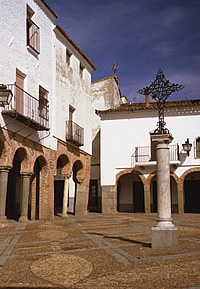 Trujillo: courtyard at the Parador. 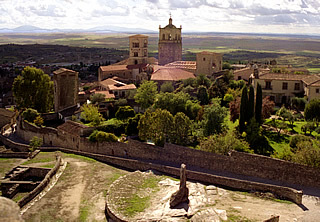 The town seen from the castle. 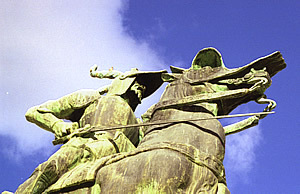 Equestrian statue of Francisco Pizarro. 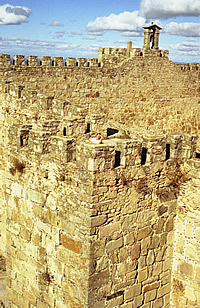 Fine battlements at Trujillo castle. 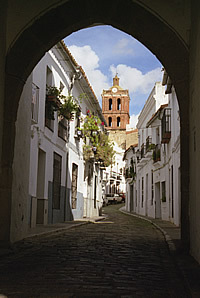 Trujillo is a lovely town, well off the usual tourist trail. We had lunch in the Plaza Major sampling one of the local specialities: Migas – fried diced bread with chorizo and peppers, which was good but a bit dry. 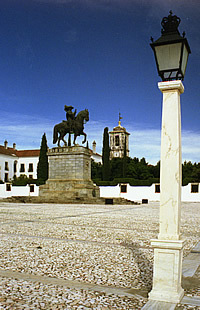 The equestrian statue in the Plaza Major is of Francisco Pizarro, a swineherd who became a famous Spanish conquistador, the conquerer of Peru. 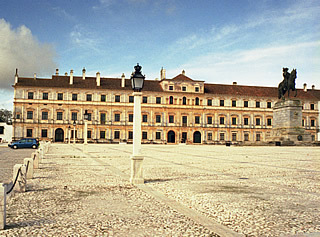 The Plaza Major is very grand, of an unusual irregular shape, and surrounded on all sides by mansions, built with the riches plundered from South America. 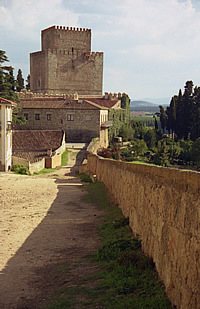 The old town is dominated by a castle with fine walls which was fortified by Moors and still retains the Moorish water system. Trujillo: Plaza Major at night. 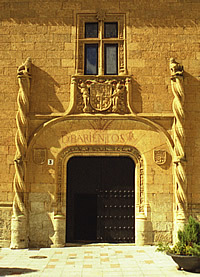 Zafra: entrance to the Parador. We left for Zafra early in the morning to travel through low mountains and having breakfast in Montanchez: coffee and hot chocolate pastries, like sausage-shaped pain au chocolat but with a higher chocolate to pastry ratio – really excellent! Also to buy their famous dried jamon iberico for lunch on the way. It's an interesting spot, though we didn't linger.The location was chosen by the Romans, who founded the town, for its strategically important aspect above the surrounding countryside, but then inevitably taken by the Moors who built the (now ruined) castle. 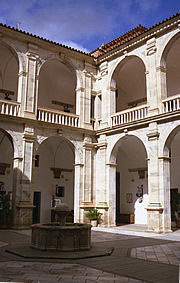 Courtyard of the Parador, Zafra. 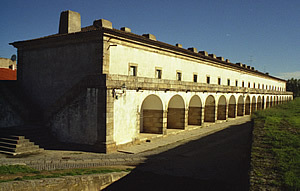 We continued via Arroyomolinos, where the British under General Hill inflicted a defeat on the French on 28th October 1811, to the Parador at Zafra which is fantastic with a stunning entrance and courtyard. 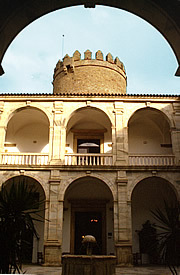 It is, in fact, a 15th century castle, once the home of the Dukes of Feria, one of Spain's most important families. 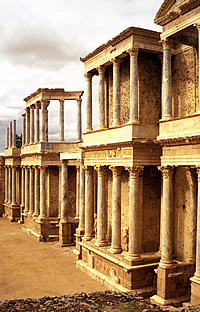 Zafra was a strategically important town situated on the Via de la Plata in Roman times mid-way between Seville and Merida and close to Badajoz. 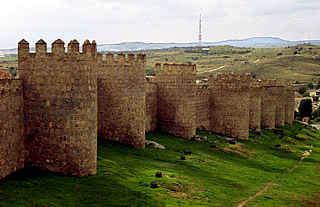 It was also important to the Moors as it lay on the border of the Seville and Badajoz territories. 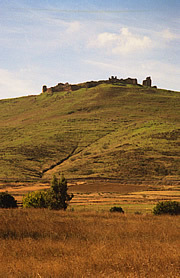 It was the Moors who first built a fortress here. 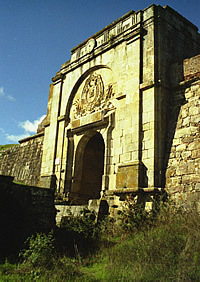 In the 15th century the medieval town was surrounded by a wall, now mostly disappeared, though a couple of imposing gates remain. 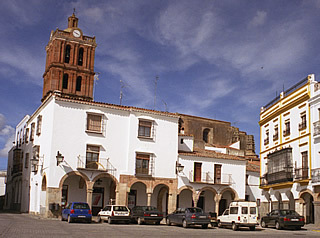 This pleasant town has two lovely squares: la Plaza Grande and la Plaza Chica, both with shady arcades. Plaza Grande is much the bigger of the two with white-washed buildings, glassed-in balconies and traffic, Plaza Chica a quiet oasis. 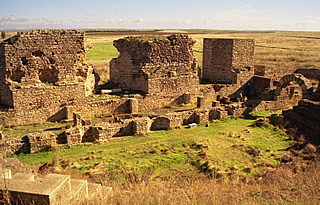 Near Zafra we came upon an archaeological dig unearthing a Roman Theatre, nearby were the ruins of a fortress on a hill - the area must be full of Roman and Moorish remains. 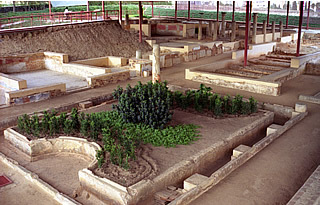 A Roman Theatre under excavation near Zafra. 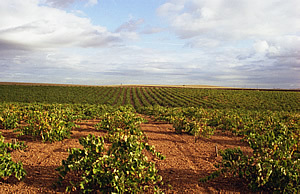 The site of the battle of Albuera, now beautifully cultivated farm land. 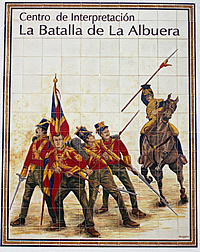 From Zafra the Peninsular War interests were the battlefields of Albuera and Badajoz. Badajoz is a terrible place seemingly full of impatient bad-tempered drivers. We fled to Elvas, in Portugal, which is a lovely town. After the chaos of the Badajoz traffic we indulged in a glass of wine at the Pousada before exploring the town which boasts very fine 13th century fortifications further strengthened with moats and star-shaped ramparts in the seventeenth century. 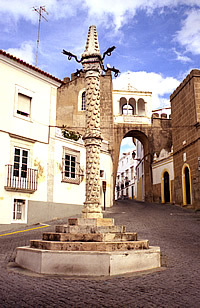 We walked up through the Arab quarter passing the Manueline pelourinho or pillory - an exuberant architectural style which developed during the successful reign of Manuel 1 (1495 – 1521). This pillory has four hooks at the top from which criminals were chained. 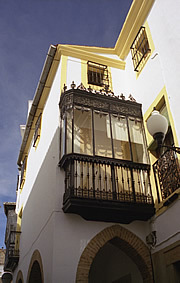 This whole area has some really lovely architectural features on archways, balconies, around windows and at rooflines. On to the 13th century castle where it is possible to walk along the ramparts, before returning for lunch in the main square. After lunch more exploration of this little gem of a town ending at the wonderful English Cemetery with memorials to individuals and units engaged at Albuera and Badajoz. 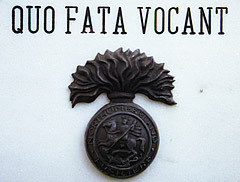 "Quo Fata Vocant" - "Whither the Fates call", Regimental Motto of the Royal Northumberland Fusiliers. 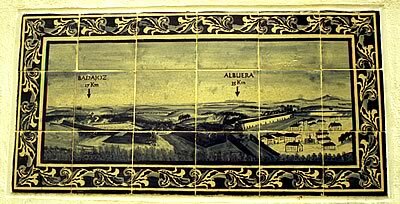 The Elvas Coat of Arms on the aqueduct is made of ceramic tiles. 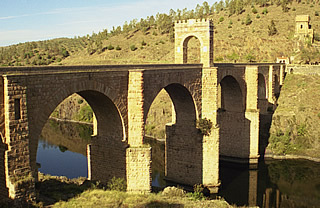 Finally, an exceedingly impressive structure: the Aqueduto de Amoreira. Largely built in the sixteenth century it is a jagged 17km stretch of up to to five tiers of arches carrying water into the town. 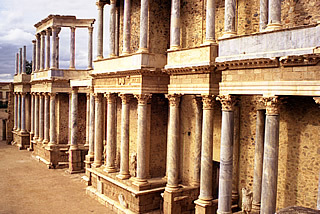 Merida has one of the most impressive Roman theatres we have seen anywhere. The town Augusta Emerita was founded in 25B.C. where no settlement previously existed but which was of great strategic importance to the Romans being on several major inter-city routes. 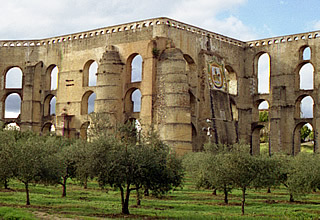 It has remains of an amphitheatre, Temple of Diana and villas but the undisputed highlight is the theatre, built by Agrippa, commander of Augustus's victorious fleet in the Battle of Actium and consul in Rome. Agrippa was a very powerful and strong ally of the emperor Augustus, travelling widely in the empire on his behalf, promoting construction of roads projects and supressing revolts and maintaining order where necessary. We had an excellent lunch in Merida. We had no idea where we should eat but saw a Restaurant Briz, which was very well patronised. It was a simple room crammed with tables and every one occupied, only two places left which we were able to take. I had potato soup (yellow as usual) and Andrew a spicy meat macaroni – both excellent. After lunch we went to see the remains of a Roman aqueduct, though a rather squalid approach the structure itself is impressive but standing in a dry river bed so not the most attractive scene. 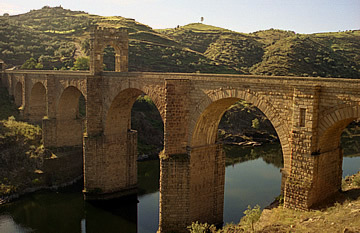 Then on to a Roman bridge over the Guadiana river - the longest Roman bridge in Spain it is very beautiful boasting 64 arches, originally it had 81 but 17 were destroyed by the French in the siege of Badajoz. 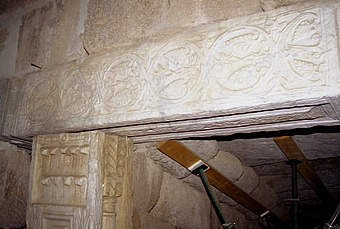 Beautiful Visigothic (7th century) stonework can be seen used as lintels and uprights at the entrance to the underground Roman cisterns, vines and bunches of grapes figure strongly. 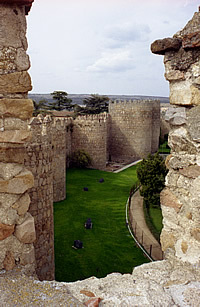 The Moors occupied Merida in the early 8th century and enlarged the Alcazaba which was originally the Roman fort. Littering the Alcazaba are a huge number of large mosaic pavement fragments, stacked ready perhaps for restoration. 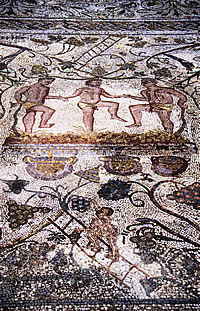 Grape-treading mosaic in the amphitheatre villa. 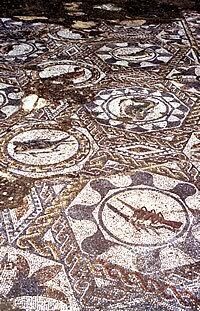 We visited the remains of two Roman villas: the amphitheatre villa which has a very nice mosaic of grape-treading, and the Mithraun villa which has a well-explained layout and a fine, though incomplete, cosmological mosaic floor. 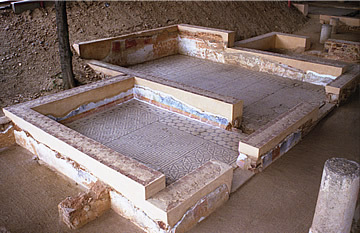 Rooms with mosaic floors and the remnants of wall painting in the Mithraun Villa. 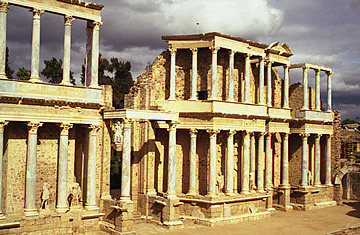 We were so impressed with Merida we returned to take better photographs and to visit the really excellent modern museum, Museo National de Arte Romano which was completed in 1986 to house the archaeological treasures from Augusta Emerita. 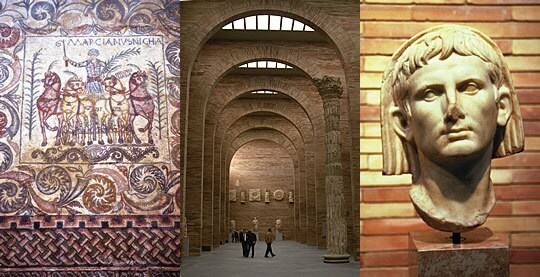 With a high central hall and three floors of artefacts a visit is highly recommended, especially for some fine sculpture and fantastic mosaics. 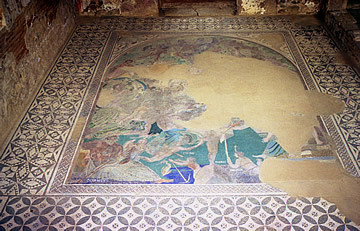 Cosmological mosaic in the Mithraun Villa. 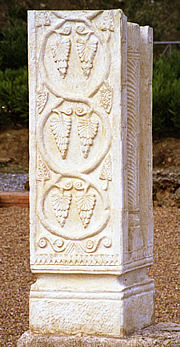 Fine Visigothic column in situ. Fabulous mosaic, museum hall and head of Augustus in the museum. On a day of further battlefield exploration we ventured again into Portugal passing Elvas and heading into an area known for its marble quarries. Vla Borba – very white and masses of marble used for the most everyday architectural features such as shop door lintels and window frames – and on to Vila Vicosa which is very fine indeed. Dazzling in the sunshine, marble is in evidence everywhere: lamp posts, kerb stones, even large marble chips used as paving. 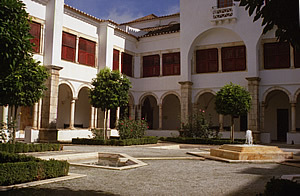 The Ducal Palace tours are only in Portuguese so we settled for coffee in the Pousada – once a convent – in a sunny peaceful courtyard with a fountain. Our final stop on this trip was Oropesa where we stayed in the Parador. This was another strategically important site to the Romans. 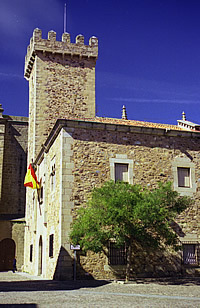 The castle here was built by the Arabs in the ninth century and the town has many fine sixteenth century buildings. 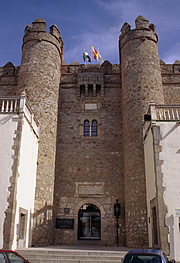 The Parador is a thirteenth century palace built on the site of a more ancient palace which had been destroyed in the reconquest. 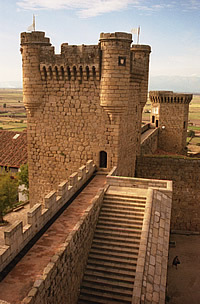 For 500 years it was home to the Counts of Oropesa. A relaxing place to stay which prides itself on its food, particularly game which it is well-placed to provide! The Michelin Guide to Spain and The Rough Guide to Spain were used on this trip.